If your traditional hosting account just isn't cutting it anymore, Everleap can bring your sites and applications back to life. We believe that one day all shared hosting will work the way that Everleap works now. But until then, if you want affordable .NET cloud hosting that can scale along with your growth, Everleap is where you want to be. We believe so strongly in what we're doing that we'll let you try it for 30 days for free. We're confident that once you try Everleap you'll never go back to traditional hosting. In this test, we recorded the average response time with a sustained load of 50 users on identical installations of a nopCommerce v3.5 demo store site. For Everleap we tested our Single site plan, at Arvixe, BusinessClass ASP, at GoDaddy, Ultimate and at DiscountASP.NET the base plan (see methodology section below for more details). 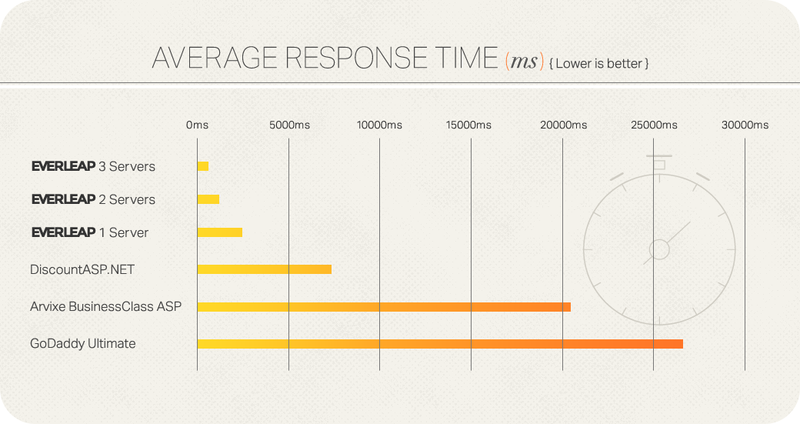 You can see here that the 50 user load had an average response time of 2.52 seconds on Everleap running on 1 server. At DiscountASP.NET, 7.37 seconds. Under the same load, Arvixe BusinessClass ASP had average response time of 20.32 seconds, and GoDaddy Ultimate, 26.43 seconds. Both of those speeds would be classified as errors in the next test we're going to show you, because the majority of users are not going to wait more than 20 seconds for a page to load. As you might expect, increasing the number of servers and using our automatic load balancing substantially improved the average response time. Since it isn't possible to run a site on multiple servers at a traditional shared host there is no comparison to be made, but we included these results to demonstrate how performance increases as Everleap scales. We should mention that when we asked if anything could be done to improve performance - which is something we did for every plan we tested - Arvixe increased the amount of available memory. These results are from tests done with the increased memory. For this test Everleap running on a single server handled 175 clients consistently and simultaneously hitting the site before generating an error. DiscountASP.NET was able to manage 110 users before an error. 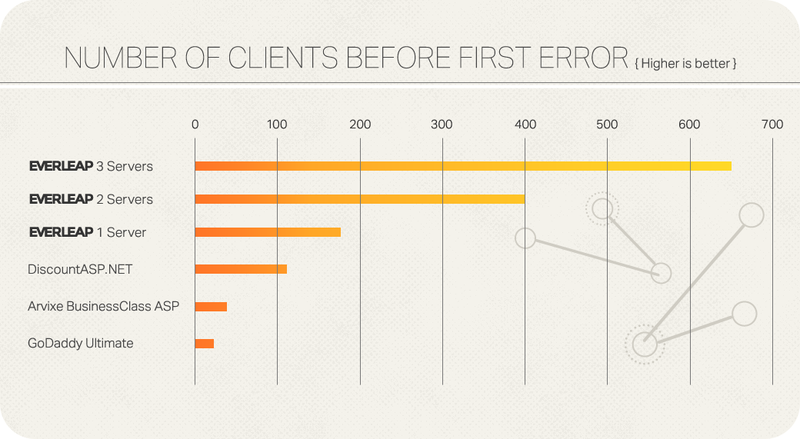 Arvixe BusinessClass ASP began to fail at 35 users and GoDaddy Ultimate gave up at 20. Again, you can see the positive effect scaling and load balancing had on the results when we increased the number of servers at Everleap to 2 or 3. With 3 servers Everleap handled 32 times the traffic of the GoDaddy Ultimate account and more than 18 times the traffic of the Arvixe account. Note that these are stress tests, and replicate some pretty extreme real-world activity. Most e-commerce sites will never have to accommodate 100 users placing orders simultaneously. But every e-commerce site wants that to happen. And if and when it does happen, you don't want to be a victim of your own success. For the tests we used identical installations of a nopCommerce v3.5 demo store site. Databases were SQL Web Edition. We used the database that was provided with or available to the hosting plan. SQL 2014 was not available at every host, so for the sake of consistency we used SQL 2012 for all test installations. Individual plan details are provided at the bottom of this page.